Save $61 on this month's International Selection! At last, some influential California voices are joining the chorus against rising alcohol content in table wines. Now we'd like to see the industry stop trying to meet the neo-Prohibition crowd halfway.  The California Wine Club Save $61 on this month's International Selection! 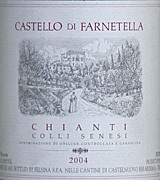 Rational alcohol levels provide balance in this "benchmark" Siennese Chianti from a decent vintage. A major report from Port expert Roy Hersh on the 2004 Vintage Ports tops the bill of fare this week. Plus: We start a two-part series on "learning German wine" in Saturday's Internet Radio TalkShoe. In our forums, we're viewing with alarm the $300-a-bottle futures offerings for Angelo Gaia, and taking a poll on rising alcohol levels: Good, bad or evil? For most of us who prize elegance and balance in our wine, there's no news, and certainly no good news, in the recent trend toward higher and higher levels of alcohol in table wines. Some big reds are getting up over 15 percent alcohol and almost approaching the strength of fortified wine ... or Night Train Express. I've written about this repeatedly over the past decade, and I know I'm not alone: A large proportion of wine lovers who prefer our wines food-friendly and balanced have been yelling for years about "alcohol creep" and the big-name wine critics who seem to encourage it by awarding high points ratings to monolithic, mouth-searing high-alcohol blockbusters. There's been no shortage of critical disdain for these wines among European wine enthusiasts and writers and New World wine lovers who don't care for a kerosene character in our wines. But it's been a particular pleasure in recent weeks to see some respected voices in California starting to say "Enough!" Quickly told, Darrell Corti, a long-time Sacramento wine-shop owner who's never been shy about expressing his opinions, recently declared that he won't even allow table wines over 14.5 percent alcohol by volume on his shelves. Although Corti acknowledged that he might make exceptions, this decision (according to the Sacramento Bee newspaper) drew anguished screams from critic Robert M. Parker Jr. himself, a response that seemingly left Corti unmoved. Last week, I got an E-mail (as, apparently, did hundreds of other wine writers and wine-industry people) from wine maker Randy Dunn, singing in harmony to Corti's refrain: "It is time for the average wine consumers, as opposed to tasters, to speak up," Dunn wrote. "The current fad of higher and higher alcohol wines should stop." Dunn, once wine maker at Caymus and now owner of his own Dunn Vineyards, went on: "I don’t believe the average person is so insensitive to flavors and aromas that they must have a 15% Cabernet, Chardonnay, or Pinot Noir to get the aromas and flavors. Influential members of the wine press have led the score-chasing winemakers/owners up the alcohol curve and now I hope that it soon will lead them down." It should be noted that critical points-chasing alone is not entirely responsible for alcohol creep. A tendency toward warmer temperatures in world wine-growing regions in recent decades has increased ripeness and thus potential alcohol; modern yeast strains also have increased the amount of alcohol that producers can squeeze out of a grape. Indeed, there's a cottage consulting industry using high-tech techniques in the winery to keep wine alcohol from going even higher. But critical acclaim for BIG wines certainly hasn't slowed the trend, and as Dunn points out, it would be a fine thing to see critical voices start to slow it down. While I'm still in rant mode, a word about the Disney studio's recently announced decisions to market - and then not to market - a modest brand of French Chardonnay as a product tie-in with its recently released (and excellent) animated movie, Ratatouille. Disney's quick capitulation to anti-alcohol forces didn't really surprise me, but I'm a more irritated about the California Wine Institute's pathetic eagerness not to offend the "neo-Prohibitionists." As I wrote in our WineLovers Discussion Group, I'd have a lot more respect for the industry if it would take a tough position and say, "Look, if you want to be a teetotaler, fine, but we will not cooperate in your efforts to impose your Puritanical morality on the rest of us. If you don't want your children drinking alcohol, then make your children your business. Frankly, wine in moderation is beneficial to adults, and it's actually not the end of the world if a youngster takes a taste." Rant over. For this week's tasting, enjoy with us a delicious Chianti marked at just 12.5% alcohol. As Hamlet said, "'tis enough. 'twill serve." My notes are below. The California Wine Club: Save $61 on this month's International Selection! La Dolce Vita ... and even sweeter when you save $61 on this month's international wine club feature from The California Wine Club! Barbaresco Langavini 2003 Red Wine - Deep garnet, with touches of orange. This big Barbaresco starts with fragrances of wild roses and vanilla, then finishes with rich and generous flavors. Roero Arneis Bosio 2006 White Wine - The color of summer straw, with fragrances of white flower and citrus. Beautiful tropical-fruit flavors. Baracchi Extra Virgin Olive Oil - Lovely green olive and artichoke flavors with a hint of nuttiness. When you join the club for yourself, this fantastic Italian Adventure is just $46 (a $61 savings). International Selections features hand-selected, limited-production wines from the world's best small, family-owned wineries. Imported directly by The California Wine Club and not found anywhere else in the U.S.! Shipments average $65-$80 every other month and include a fact-filled newsletter, including tasting notes and details on the winery and country of origin. and use promo code: DolceVita-07 at checkout. FOOD MATCH: A natural with pan-seared natural lamb chops; it wasn't bad, either, with the accompanying flavors of fresh heirloom tomatoes and spaghetti with butter and sage. VALUE: Not only is the 12.5% alcohol moderate, but so is the price: A buy-it-by-the-case choice in the low teens. WHEN TO DRINK: A couple of years in the cellar won't hurt it, but it's drinking beautifully now and probably won't ever get any better than this. The trend toward more frequent releases of "second label" Vintage Port seems here to stay, and it looks to be a positive for both the Port trade and consumers, says Port expert Roy Hersh, who offers this extensive report on the Vintage Ports of 2004. Our resident specialist David Bueker promises to gently transform us from novice to connoisseur level German wine expert in two episodes. We'll talk about German label deciphering and the basics in our next Internet Radio TalkShoe on Saturday, Aug 4, at 1 p.m. US EDT (10 a.m. on the U.S. West Coast and 19:00 in Western Europe).  WineLovers Discussion Group: $300 a bottle ... on futures!? Yes, we know, supply and demand and critical acclaim equals rising prices. Still, $300 per bottle seems a bit like a sign of the End Times. Join this spirited conversation and add your opinion in our WineLovers Discussion Group! Just about every wine enthusiast has an opinion about the modern tendency toward higher alcohol, as many wines have crept from 12 percent alcohol by volume to 14 or more. Some of the big-name critics seem to love it, but the development isn't universally hailed, and some voices are starting to cry, "Enough!" What's your opinion about rising alcohol in table wines? Evil, great, unfortunate or somewhere in-between? Cast your ballot in this week's CompuServe/Netscape forum poll!